Relying on free agency in the NFL is a historically risky way to live. The open market is the Craigslist of professional football, full of already used goods that, for one reason or another, weren’t considered worth keeping around. But there are times when, for whatever reason, great players wind up as goods in the NFL shopping spree. Relying on free agency in the NFL is a historically risky way to live. The open market is the Craigslist of professional football, full of already used goods that, for one reason or another, weren’t considered worth keeping around. When a player hits free agency, there’s always a question about why it was allowed to happen. If he’s really that good, why would a team just let him walk out the door? There are times when, for whatever reason, great players wind up as goods in the NFL shopping spree. It can be because of injuries, cap issues, even a relationship with management gone bad. Even though the history of free agency is littered with horror stories of cap-crushing, big-money deals, there are occasionally players to be found that can alter a franchise’s history forever. We tried to figure out the five best free-agent contracts ever. Drew Brees is the exception that proves all the quarterback rules. Short quarterbacks can’t win … except for Drew Brees. Second-round quarterbacks don’t pan out … except for Drew Brees. Free-agent quarterbacks never work … except for Drew Brees. When very good players hit free agency, it’s often because a collection of circumstantial factors landed them there. When very good quarterbacks do, it requires an aligning of the planets. The Chargers went 9-7 in 2005, behind one of the best offenses in football. LaDainian Tomlinson and his 1,832 yards from scrimmage didn’t hurt, but while Brees wasn’t the Pro Bowl player he’d been in 2004, he was still a very good starting quarterback in a league increasingly dependent on them. San Diego’s question was whether “very good” was enough. The 9-7 finish kept the Chargers from the playoffs for the ninth time in 10 years. And they had alternatives to consider. Lurking on the bench was Philip Rivers, whom San Diego had more or less taken with the first pick in the draft a year earlier. That wasn’t the only factor. In the final game of the season, while diving for a loose fumble, Brees’s throwing shoulder had been — I think I have the medical terminology right here — severely fucked up. He had a horribly dislocated shoulder, a 360-degree tear in his labrum, and there were questions about how the damage would affect him long-term. It was enough for San Diego to let him hit the market. 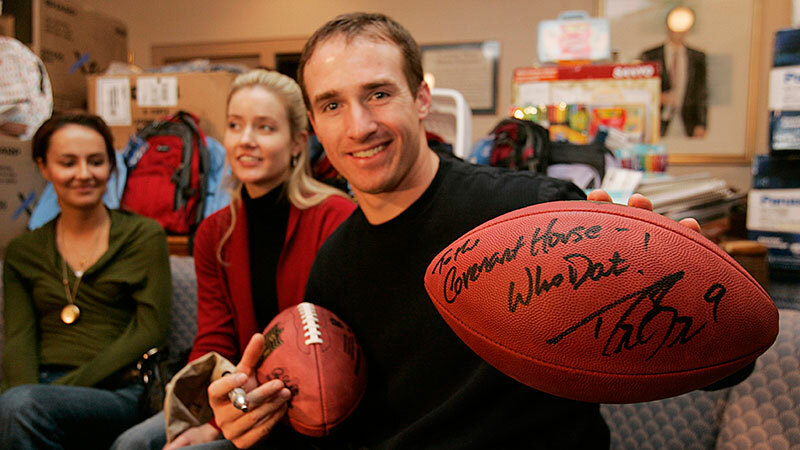 The two teams associated with the Brees pursuit that offseason are the Dolphins and Saints, and the fate each franchise has endured since is a common topic. The Dolphins famously failed Brees on his physical, a story Nick Saban, then Miami’s head coach, and Brees both corroborate. “I do remember [the team’s doctors] saying I had a 25 percent chance of coming back and playing,” Brees told the Miami Herald this past fall. The Dolphins pulled out of the bidding on March 15 and sent a second-round pick to Minnesota for Daunte Culpepper. That immediately led Brees to choose the Saints, whose offer had all along come with more guaranteed money and the promise that their new quarterback would be built up as a symbol of the franchise’s revival. Miami has had 10 starting quarterbacks and no playoff wins since. The Saints … well, they’ve done a bit better behind center — 80-47, 38,733 yards, 283 touchdowns, seven Pro Bowls, one Super Bowl, and a nonstop ticket to the Hall of Fame. The worst part of being a Bears fan the past two decades has nothing to do with the revolving door of awful at quarterback. It’s having to deal with the Packers at every turn. Green Bay is notoriously cheap with its free-agent money, presumably because no sane person wants to live in Green Bay, but also because both Ron Wolf and Ted Thompson are steadfast in adhering to their team-building methodology. It’s why we never hear about cap troubles or panicked franchise tagging in Green Bay; when the Packers want to keep one of their own, they do. There are two exceptions to that homegrown approach, and both of them — maddeningly — have an undeniable case for this list. About a month after the Saints signed Drew Brees, the free-agent pool had dwindled down to its normal bargain-basement options — with one exception. Charles Woodson spent both the 2004 and 2005 seasons playing with the franchise tag in Oakland. He also finished both of those seasons on injured reserve. Woodson played just six games in his final year with the Raiders after suffering a broken leg in October. When he hit free agency, he was a 29-year-old, injury-prone cornerback who seemed to be on the downside of his career. The battle for Woodson — one that wasn’t all that fierce — was between the Packers and Bucs, who reportedly planned on moving him to safety. Woodson, not without trepidation, opted for Green Bay. Over the next five seasons, he may have been the best defensive player in football. 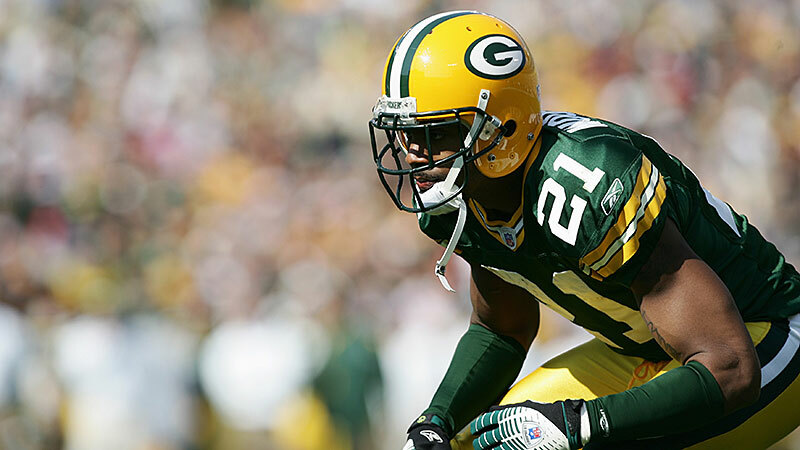 Woodson was technically a cornerback, but really he was the Packers’ do-everything instrument of destruction. In 2009, Woodson had a league-leading nine interceptions (three returned for touchdowns), four forced fumbles, and two sacks. The Packers won the Super Bowl, Woodson was named Defensive Player of the Year, and one of the great second acts in NFL history was written in stone. Just as it did this year, the salary cap took a leap in 1998. The jump was actually the same — about $10 million — but the difference is that 15 years ago, that represented a 25 percent increase in the cap. Teams that weren’t planning on being buyers were instantly thrust into contention for players. When that offseason began, few teams were expected to be more cautious shoppers than the New York Jets. The team’s 1996 offseason, the last before the controversial arrival of Bill Parcells, was almost immediately recognized as a spending disaster. Four players — quarterback Neil O’Donnell, tackles David Williams and Jumbo Elliot, and receiver Jeff Graham — were given a combined $55 million in contracts, including $16.2 million in signing bonuses. With a cap number around $46 million, the Jets were expected to be up against the financial wall. The $10 million leap provided a bit of wiggle room, but that didn’t mean anyone expected much. “The Jets may be comfortably beneath the league’s elevated salary-cap ceiling as they enter the free-agent shopping period today, but don’t look for a resulting spending frenzy in coming weeks,” Newsday wrote. Parcells’s plan wasn’t headline-worthy. The first order of business was solidifying the middle of the offensive line. Among the host of potential names was 27-year-old Kevin Mawae, who’d played all over the interior of the offensive line for the Seahawks. In that same Newsday story, Mawae’s name was thrown in as an afterthought following the laundry list of potential signees: “Also, keep an eye on center Kevin Mawae (Seahawks), considered a prime diamond in the rough.” A week later, the Jets made Mawae the highest-paid center in football with a five-year, $17 million deal. Mawae proved to be worth every cent. In his seven full seasons with the Jets, Mawae went to the Pro Bowl six times, was named first-team All-Pro twice, and emerged as one of the best centers of the decade. Considering the madness surrounding Russell Wilson’s ceremonial time with the Texas Rangers this month, it’s difficult to imagine how the Internet would have responded to early-’90s Deion. Sanders famously flew to a playoff baseball game on the same day the Falcons played in 1992, but while baseball eventually helped end his football marriage in Atlanta, it’s what allowed his move to San Francisco. When the baseball strike took hold in August 1994, Sanders — then an outfielder for the Reds — maintained that he had no plans to go back to football during the stoppage. But as it became clear that nobody was putting down the picket signs anytime soon, Sanders and agent Eugene Parker began to solicit offers. A handful of teams lobbied for Sanders, who was looking for a multiyear deal in the range of $4 million annually. The problem was that by August, most teams had let the glue set on their financial models. Room was scarce, and teams like the Dolphins had to play around with Dan Marino’s contract to even entertain the idea of bringing Deion aboard. Two weeks later, after a Week 2 loss to the Chiefs, Policy backtracked. Some time had passed since the camps had talked, but the door was still open, even if it was just a crack. “If there’s a continued interest in playing for the 49ers, if he can see the value of playing for us one year and if he can understand the limitations we’re under salary-cap wise,” Policy told the Mercury News. “If we get a call to the effect this is where he wants to come, that will totally renew our interest, and we’re going to bend over backward to see if it can work.” Two days later, the rest of the baseball season was canceled, and in less than 24 hours, Sanders was a 49er. San Francisco restructured three contracts to build enough room for Sanders’s one-year, $1.1 million deal, and in doing so, brought in one of the best cover corners ever at the very height of his powers. Sanders intercepted six passes in 14 games, returning three for touchdowns. San Francisco finished third in pass-defense DVOA, up from 14th the year before. 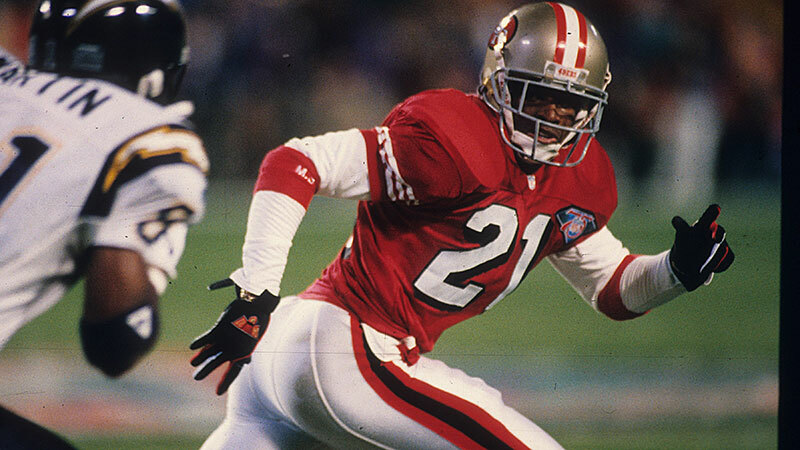 Sanders finished first-team All-Pro, was named the Defensive Player of the Year, and had two more interceptions in the playoffs — including one in the Niners’ 49-26 win in the Super Bowl. That offseason, Sanders signed a five-year, $30 million deal in Dallas, where he won his second straight Super Bowl. When you need a miracle, it doesn’t hurt to have God — and the most money — on your side. When free agency opened for the first time in NFL history in the spring of 1993, the inaugural class was led by Eagles’ pass-rushing terror Reggie White. In his eight years in Philadelphia, White’s résumé already put him among the best defensive ends to ever play. He’d accumulated 124 sacks, including three seasons with at least 18 and double-digit totals every year. White was set to turn 32 during the first year of his new contract, but no one doubted that he had plenty left to give. White’s tour of the NFL that spring included eight stops, but when the bidding started to heat up in late March, the list had shrunk to three: Washington, San Francisco, and Green Bay. The Packers, despite having the biggest offer at four years and $17.2 million, were considered a long shot mostly due to their status as the smallest market in professional football. In a vacuum, Ron Wolf was offering the most money, but considering the premium needed to lure a player like White to Green Bay, it wasn’t that much more. The Packers were doing everything they could to lure White north, including providing a weekly flight to Milwaukee for White to provide ministry services for inner-city youths. In the end, their efforts were enough. The prospect of winning a championship with Brett Favre and Wolf (and the biggest offer on the table) brought White to Wisconsin. “When I went up there [in March], my plan was to get to Green Bay and get out of Green Bay,” said White. “It was a courtesy call at first. But I’m a relationships kind of guy, and I got something real strong going with Ron Wolf, [coach] Mike Holmgren and [defensive coordinator] Ray Rhodes.” When the topic of Green Bay’s underdog status in the race came up, Wolf bristled. “You know, despite the perceptions, we’ve actually got electricity and indoor plumbing here,” he said. Three years later, they also had the franchise’s third Super Bowl title.